Strong neodymium magnets made by Applied Magnets are composed of top quality Neodymium, Iron, Boron rare earth materials, they have excellent magnetic property and extremely strong for its size. 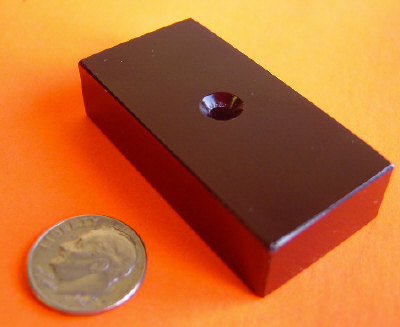 Neodymium magnets are the strongest types of permanent magnets. They have highest maximum energy product among all permanent magnets. All of our strong neodymium magnets are ISO Certified, top notch quality guaranteed. Strong Neodymium magnets are the world's strongest magnets. All magnets are not created equal! Applied Magnets offers the highest quality strong neodymium magnets with consistent performance at lowest price. Our strong neodymium magnets are designed & manufactured to meet stringent quality standards using the latest technology. Neodymium magnets (also known as Neo, NdFeB, NIB or super magnet) , a type of rare earth magnets,are the permanent magnets made from neodymium, iron, boron and other minor elements. Strong Neodymium Magnets N48, stronger than N45, N42, N40, N38 and N35. 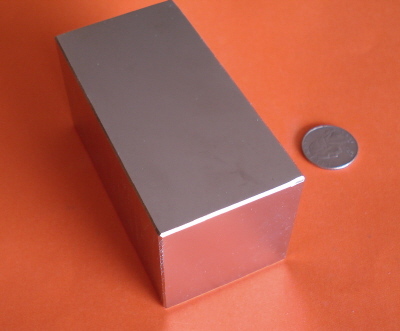 Super Strong Neodymium Magnets N48 4 inch x 2 inch x 2 inch Thick Rare Earth NdFeB Block Magnet. Approximate pull force: over 710 lbs.